At GDP|GUHDO we strive to help our customers optimize cutting tool performance and cost – we recently contributed this article to the ISFA (International Surface Fabricators Association) for the Q4 2014 issue of Countertop & Architectural Surfaces Magazine . While the homogeneous composition of solid surface material doesn’t generally pose particular machining challenges, there are great ways to reduce your overall tooling expense, increase tool life, improve finish, reduce down-time and maintain a smoother work flow by selecting the correct cutting tool for the application. 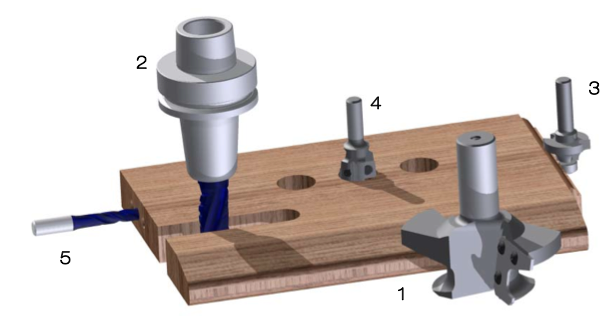 Whether tooling is needed for use on a hand-router at installation site or production tooling in the shop, options available to streamline production, reduce down time, eliminate sanding and cut cost are overlooked all too often. We are happy to announce this article was featured in Cabinetmaker FDM in Nov ’14. Here is the original text in its entirety. With the plethora of saw blades available in the market today, it can be daunting for the user to choose the right blade for the right application. Since Chinese-made blades have heavily infiltrated the wood products industry with low prices in recent years, it has become even more difficult to determine which blade is right. Low pricing can be very tempting! Visually, blades can be hard to differentiate since all are circular, they all have a hole in the center, and they all have teeth around the circumference – that’s about where the similarities end. 3 Ovolo Cutter T.C. Z2 No. For more information visit our website at guhdo.com!